Registered nurses (RNs) in the West and Northeast continued to take home the biggest pay checks in 2015, according to a survey on nurse compensation. RNs in the Western states of Alaska, California, and Hawaii earned on average $98,000 in 2015, more than anybody else. The number 2 spot for earnings belonged to the Northeast, at $85,000. Trailing the pack were RNs in the North Central states ($70,000). 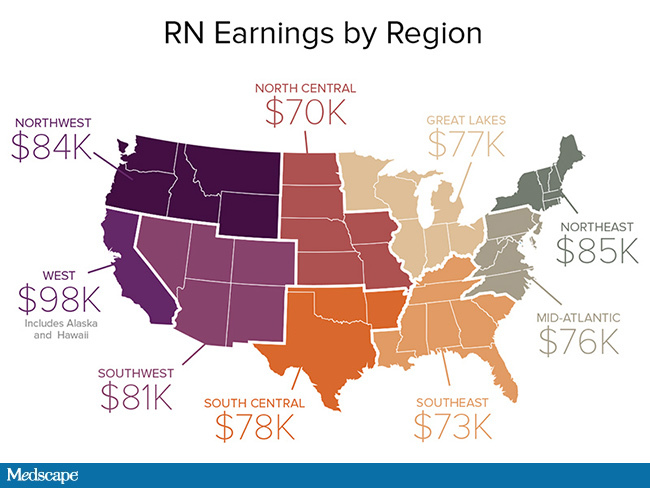 Nationwide, annual earnings for RNs stood at $78,000 last year. The West and Northeast also ranked 1 and 2 in Medscape’s survey of RN compensation in 2014. Better pay on the coasts largely reflects the higher cost of living there, said Peter McMenamin, PhD, a senior policy fellow and health economist at the American Nurses Association (ANA). The presence of a robust nurses’ union, particularly in California, also helps explains why RN wages are higher in these regions, Dr McMenamin told Medscape Medical News. On the whole, regional variations in earnings for licensed practical nurses (LPNs) followed the same pattern. LPN compensation was highest in the West ($50,000), with the Northeast ($49,000) and Southwest ($49,000) trailing close behind. 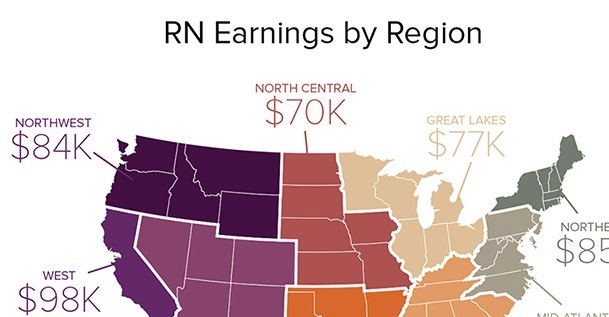 LPNs in the North Central states posted the lowest annual earnings ($39,000) in the nation These findings emerge from an online survey of roughly 10,000 RNs, LPNs, and advanced practice registered nurses (APRNs) conducted earlier this year. LPNs include the similar professional cadre of licensed vocational nurses. Medscape Medical News will analyze the earnings of APRNs in a future article.